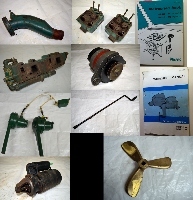 Used parts for a Volvo MD 11C Diesel (Most parts - the exhaust manifold is the exception - will work with the Volvo MD 17 as well) Scrap iron if they're cluttering your shop - GOLD if you're in need. Take it all for $475 or we can haggle over individual bits. 1 x Exhaust Manifold - with thermostat housing and temperature sender. Looks clean inside but to be honest, any used part like this should be cleaned just to be sure. You could do it yourself or any local radiator shop could "boil it". No thermostat inside the housing. Bolts for mounting the exhaust elbow included. 1 x Exhaust Elbow - The outlet "spigot"end is thinning and there's wee crack at the very end that would normally be covered by the wet exhaust hose. Good for 2 or 3 hundred hours I'm sure. 2 x cylinder heads - should be considered as rebuildable cores only. You'll need valves etc. and the copper injector sleeve on one head is damaged on the inside end. 1 x Bosch starter - Working when removed from the engine in 2017. This starter was rebuilt approximately 2009. 1 x Alternator - Stock alternator and I believe it to be 35 amps. Working when removed from the engine in 2017. This alternator was rebuilt approximately 2005. 2 x Air filters modified with thermal (flame) glow plugs. Easy cold starts. Diesel fueled (small gravity tank for reservoir, a couple of ounces of diesel goes a long way) and the plugs require switched 12V power as well. The flame (heat) is contained inside the air cleaner, there's no smell or smoke and they greatly improve cold starting. Work great but a "use at your own risk" item. 1 x Manual engine start crank handle. 1 x used "Instruction Book" for the MD 11C / MD 17C. 1 x used "Workshop Manual for the MD 11C / MD 17C. The Workshop Manual is complete but the cover is detached from the pages.